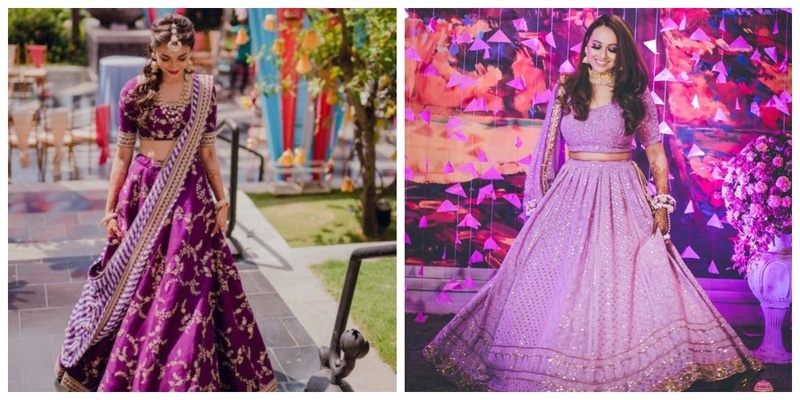 Purple is the new offbeat lehenga colour trending this season! While the mainstream red and pink lehengas are ways going to be a bride’s go to options, trying out a different and unique lehenga colour is something that most of the brides want these days. One lehenga colour that is trending a lot these days and is entire a class apart is purple. Divya, our beautiful bride just had an amazing wedding and we simply are not able to get over her wedding trousseau collection. This pretty bride chose to wear a lilac Papa Don’t Preach embellished tulle lehenga paired with a glass beaded cut work choli and looked stunning. 2. Banglore silk lehenga with light zari embroidery! I am simply in love with this simple banglori silk lehenga worn by this cutie! Featuring light zari work, this banglori silk lehenga is paired with a white and purple striped dupatta which makes it too alluring! This bride in fact opted for some great wedding lehengas, have a look here! 3. Elegant purple lehenga with light golden and silver embroidery! This beautiful lavender coloured lehenga is enough to give your mind a hard blow. With neat golden embroidery on the border and light silver tikli work all over the picture perfect lehenga gives it an additional grace of its own! This pretty bride was seen sporting a simple yet elegant purple lehenga on her wedding sangeet. The classy Tussar silk lehenga has light golden zari embroidery over it! This bride’s choice for a heavy golden thread embroidered silk lehenga is too pretty to look at! The added appeal by the paired net dupatta is what that makes this pretty purple lehenga so graceful! This bubbly bride opted for a pretty purple blingy lehenga with pigment work all over the it. The cute jacket on top makes the lehenga a trendy Indo-western trousseau! This lavender chikan lehenga with light work of tikli all over it paired with a heavy silver embellished blouse and net dupatta would be the perfect choice for your first dance night! It’s too light and perfect for a beautiful twirly dance! 8. Heavily embellished blouse for a light purple lehenga! This lovely bride was spotted wearing a subtle waist length blouse purple lehenga on her sangeet function. The blouse has heavy embellishments embedded to it while the lehenga has a subtle embellishment work all over it! 9. Our cute firang bride spotted in purple-green lehenga! This pretty firang bride also went for a pretty amazing purple lehenga and we couldn’t agree more with her sangeet bridal outfit selection! There is patch zari embroidery encircling the lehenga paired with a green net dupatta and neck embroidered blouse! 10. Heavy work velvet lehenga to own the night! This bubbly bride ruled the hearts on her sangeet night wearing this pretty velvet lehenga. The lehenga features top to down golden zari work all over it. The elbow length blouse has cut out on the shoulders giving it a trendy touch! This bride chose a glamorous purple lehenga for the as glamorous night! The sateen lehenga is embedded with floral styled embellishments while the blouse has an intricate embellishment work. Pairing it with a light net dupatta makes this one oh-so-gorgeous! 12. Purple silk lehenga with a pretty pink blouse! This cute bride was captured in a cute shot wearing a beautiful paithani silk lehenga. It is paired with a heavily embroidered pink blouse and a cute floral dupatta. 13. Heavy embellished blouse with a net lehenga for a perfect twirl! This lehenga that looks simple and elegant has a lot of beautiful work carved on it. The blouse has stone embellishments on it while the net dupatta has a blue velvet border attached to it. Along with it, this simple net lehenga features brocade work on the bottom border! Another example of a pretty bride experimenting with the beauty of colours. It features a beautiful silk lehenga with heavy golden thread embroidery paired with a tussar silk silver blouse with light neck embroidery over it! The House of Sabyasachi, which is known for sporting elegance with every collection featured this beautiful velvet lehenga paired with dual dupattas- velvet and net! The golden zari embroidery on the lehenga and polka dot embroidery on the blouse seem like just a perfect combination! If you were prepared to go for the mainstream colours, I bet these would have definitely made you give your decision for the choice of lehenga colour another thought! Well, all the best ladies!